Welcome to another (slightly short and subdued) weekly round-up, where we share (what we see as) the most interesting and important articles from the previous seven days. We’d love to hear your thoughts on any of the issues covered in the articles we’ve picked. The image is used under a creative commons license with thanks to Sara Kelly on Flickr. 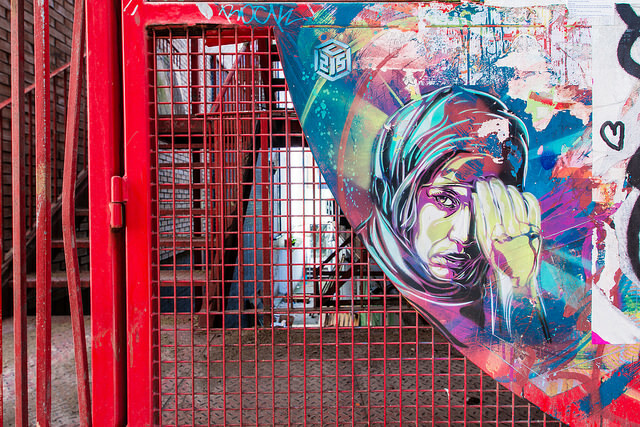 It is a photo of some striking street art depicting a person in a hijab. The person’s expression is serious, and they have their hand raised, covering one eye, appearing to be in the process of pulling their headscarf further down around their face. The art appears on a board stuck to, what seems to be, a red metal gate.